Better late than never applies in full force about the Web-based version of Android Market. It is pretty plain, and looks rushed out of the gate, but the OTA app-pushing functionality is quite the treat. If it works properly, that is. We have a few phones we have used with out test Google ID, and they appeared in our account list. Our biggest complaint is about syncing the info what's actually on your phone, and what is not. Some of the apps we had installed didn't show on the Web as installed, but the stranger thing happened when we deleted our test account and master reset the phone. 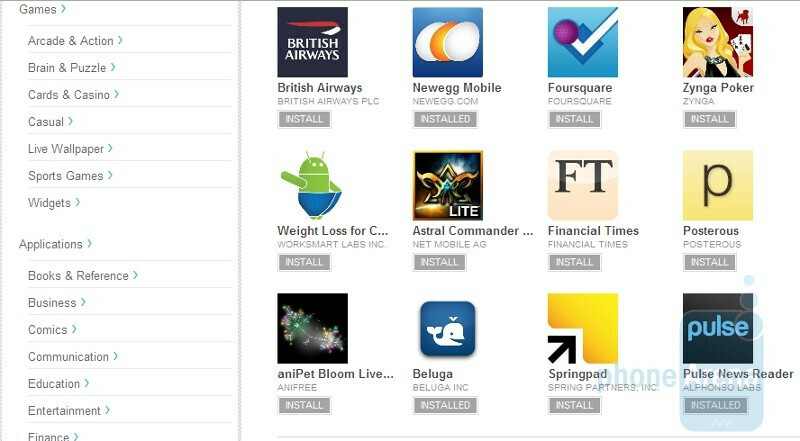 We looked into Android Market online, and these apps still showed as installed. You want to push new apps to your handset that you just did a master reset on and haven't logged into yet? No problems, Google can do that too, just that they aren't going anywhere, but still show as installed on the Web. We thought that the apps we just pushed are hanging somewhere in the air, waiting to be delivered the second we sign-up again with our Google ID. Alas, we weren't graced with their presence on the handset. 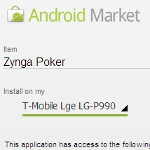 We had to log out of our Android Market Web version, sign back in, and then push the apps again. This time everything worked fine. Other users are reporting problems with OTA installation of apps when you have a custom ROM on your device, but we never expected that to work like a charm either. Overall, Android Market on the Web has its quirks and teething problems, but it is definitely a step in the right direction. Anybody else having issues with the Web version of Android Market? Great new feature from Google. I think this an amazing idea and it was implemented perfectly. There are a few minor things I would change. First off the push to phone: Amazing simply amazing, one of the best features I have ever seen. Problem: No confirmation on phone to DL the application, hence someone might push 1.6GB of data to their phone on carrier plan and be hit with overflow. Solution: Push to phone without confirmation only when phone is on wifi, or implement stack of downloads that wait for confirmation from phone to begin download. Second, Viewing apps history linked to account: Good, excellent feature I found like twenty apps I forgot about. Also saw every phone my account is on. Problem: No way to remove account from phones remotely. Solution: Implement device rejection, either send code to device that asks for password or uninstalls account for the device. Overall Celestial Being gives Google 9.8 Stars out of 10 for the online Android Market. We are pleased. Android is young still, they'll work out the kinks. Um...they have had years to work out the kinks in that sloppy mess. Every software update fixes 5 bugs and creates 20 more. Android fails. My Motorola CLIQ doesn't appear in the list! It's very weird, it shows my apps, but, when I'm going to install an app it says "There are no Android devices associated with this account". is your gmail account the register account on the phone? I know this is silly. How do you hit AND miss?